ND filters drop your frame rate as well as slow down your shutter speed; diminish the amount of light which goes into the sensor, which leads to wider apertures and longer exposure time; avoid overexposed photos caused by bright sunlight to have better color contrast and richer color. Circular Polarizing filter reduces light reflections which increases color contrast and saturation of the photos. 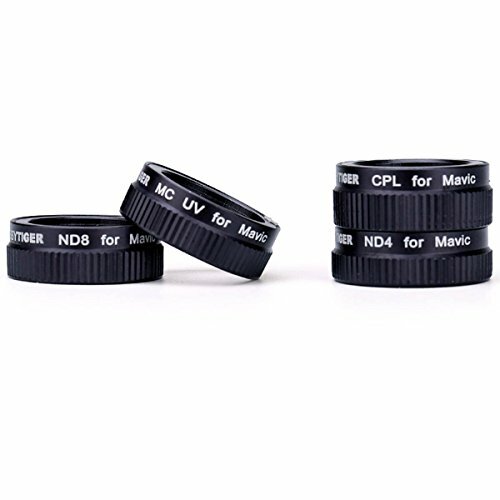 UV filter prevents UV light from entering the lens, reducing blurring. Hobbytiger lightweight lens filter is easy to install, just press the filter onto the camera. Please install it after gimbal calibration. Package: 4pcs of filters (Circular-Polarizing filter, ND4 filter, ND8 filter, UV filter) + one admission package.